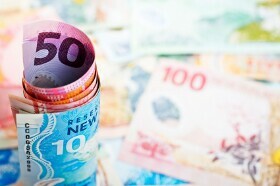 The New Zealand dollar surged today after the Reserve Bank of New Zealand surprised the market, releasing a neutral monetary policy statement, whereas market participants had expected more dovish bias. We expect to keep the OCR at this level through 2019 and 2020. We are monitoring a number of risks, and overall these appear evenly balanced for the Official Cash Rate (OCR). The direction of our next OCR move could be up or down. Later today, RBNZ Governor Adrian Orr will testify on the Monetary Policy Statement before Finance and Expenditure Select Committee, in Wellington. His comments may provide valuable insights into plans of the central bank. Yesterday, the RBNZ reported that its inflation expectations for the next two years remained unchanged at 2%. NZD/USD jumped from 0.6734 to 0.6812 as of 16:30 GMT today, touching the high of 0.6852 intraday. EUR/NZD plunged from 1.6807 to 1.6570. NZD/JPY climbed from 74.37 to 75.46, and its daily high was at 75.80.